A new version of vegetationmap4africa makes it easier to select species for agroforestry and land restoration via web, smart phone and Google Earth interfaces with a high resolution map. The map is developed by Department of Geosciences and Natural Resource Management at University of Copenhagen together with World Agroforestry Centre and other partners. An extract of the vegetationmap4africa. Click on the map for bigger picture. Nature managers on the move in Africa can now select species as they go, and at the same time gain a deeper understanding of their natural environment, thanks to a new version of vegetationmap4africa. 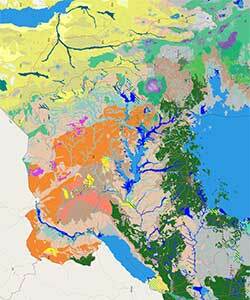 The map shows the distribution of ‘potential natural vegetation’ across the landscapes of the countries. It is expected to help those involved in landscape restoration to make better decisions on suitable tree species to use. The new version of the map has been developed by Department of Geosciences and Natural Resource Management (IGN) and World Agroforestry Centre (ICRAF) and partners. It was launched this week at the XIV World Forestry Congress in South Africa. The vegetationmap4africa currently covers eight Eastern and Southern African countries. Each vegetation type is accompanied by a factsheet that documents tree species that are known to occur within the vegetation type. A species selection tool integrated in the map can be used to find ‘the right tree for the right place’ depending on the main goods (such as fruit, fodder and timber) and services (such as shade and erosion control) desired. Each of the tree species is further linked to a wealth of online databases which gives lots of complementary information. Included in the new vegetation map is a smartphone application, developed by PhD student Paulo van Breugel from IGN. It allows you to bring the map with you in the field, even where there is no access to the internet. According to Roeland Kindt, ICRAF senior ecologist, the smartphone version of the map will greatly improve the accessibility of the map’s information. “We are excited to provide a wealth of botanical information on the web and mobile space, which can be used as a tool for agroforestry – the wise use of trees in agricultural landscapes – and as a guide for restoration of vegetation, to the benefit of smallholder farmers and managing biodiversity. The map is used not only by professional ecologists, foresters and students, but also non-specialists seeking particular bits of information about the natural environment they see in front of them.” In addition the vegetationmap4africa helps to identify potential ecotypes within species. “This extends our knowledge to recommend well adapted seed sources for particular sites,” says Jens-Peter Barnekow Lillesø, a seed systems specialist at IGN. Further on it is an ambition to extend vegetationmap4africa to even larger parts of Africa and boost the use. “The aim is both to ensure better adaption to climate change, to protect the natural vegetation and to create better economical returns for the local agriculture production,” says Lars Graudal, research leader at ICRAF and senior adviser at IGN. The map and the new smartphone app is the culmination of decades of work by many institutions and individuals in East Africa and Europe, realized with funding from private partners, among others The Rockefeller Foundation, and research funds from among others Danida.